Joshua is a teen living in modern America, with a white mother and a father who is Ojibwe living as a “non Indian”. What does that mean? It means his father tries to conform to what the narrow definition of civilised Christian that his wife insists on, only to end up disconnected from himself and his family. Joshua’s father takes off, leaving Joshua alone with his mother’s rigid outlook and rules. This would be difficult enough, but Joshua’s world is thrown further topsy turvy when his mother decides she needs to find herself and that Joshua should go stay on the Ojibwa reservation with a grandfather he barely remembers. Joshua is in for deep culture shock. he doesn’t know the native tongue spoken on a daily basis by members of the tribe, doesn’t know any of the legends, recognise any of the foods, know how to tribal dance, and encounters racism from two fronts as he’s not white enough nor Ojibwe enough according to some. Adding to his confusion is an increased awareness of his own sexuality. 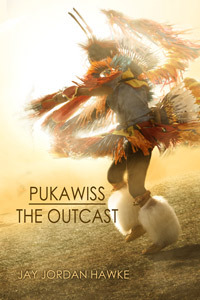 He finds personal strength through the tale of Pukawiss and through it, reaches out to embrace his native heritage and accept his homosexuality. This doesn’t set well with church volunteers who have self appointed themselves as outreach workers to the tribe, and his mother hears of his “heathen” ways. It leads to a conflict between himself, the tribe, his grandfather, mother, and the self appointed guardians of “Christian civilisation”. The far right religious views of the ministry and his mother are accompanied by ideas of “civilising” that in years past led to the en masse removal of Indian children across the uS and Canada and re-education at boarding schools where they were punished for speaking their native tongues, disallowed to eat their traditional foods, dance their dances, share their legends, or do anything else that was perceived as “Indian”. It’s what led Joshua’s father to break as he did, and why Joshua had no knowledge of his own heritage. How Joshua stands firm, claiming the power of Pukawiss for himself, is a story of great power. This entry was posted in Contemporary, ebook, m/m, Paperback, Young Adult on November 27, 2014 by Kimichan.